Our products meet the highest quality standards in accordance with the technical specifications of international industry specifications. We are a fully-integrated turnkey manufacturer with the ability to perform in-house laboratory testing and inspections to ensure the highest product quality, process control and optimal customer success. 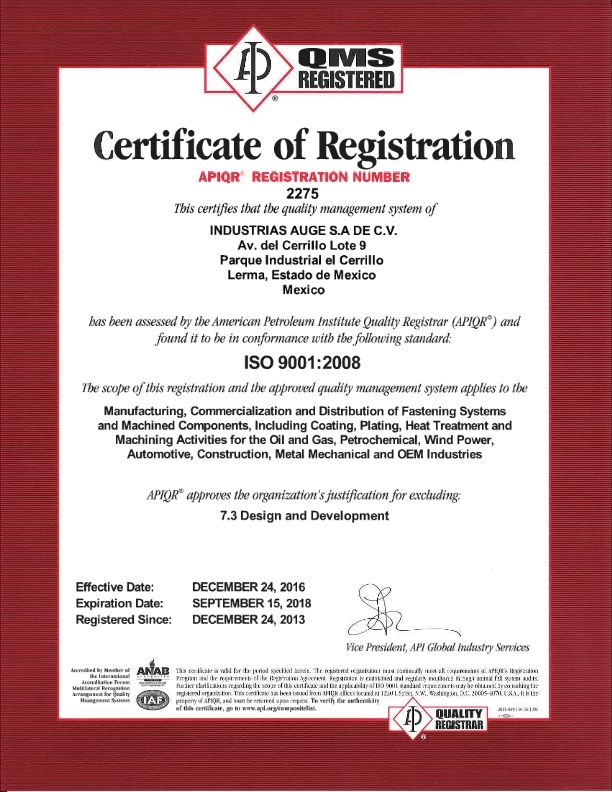 AUGE is the first international fastener company to have been awarded API 20E certification (alloy and carbon steel bolting). We got license API 20E-0002 with 3 Bolting Specification Levels. 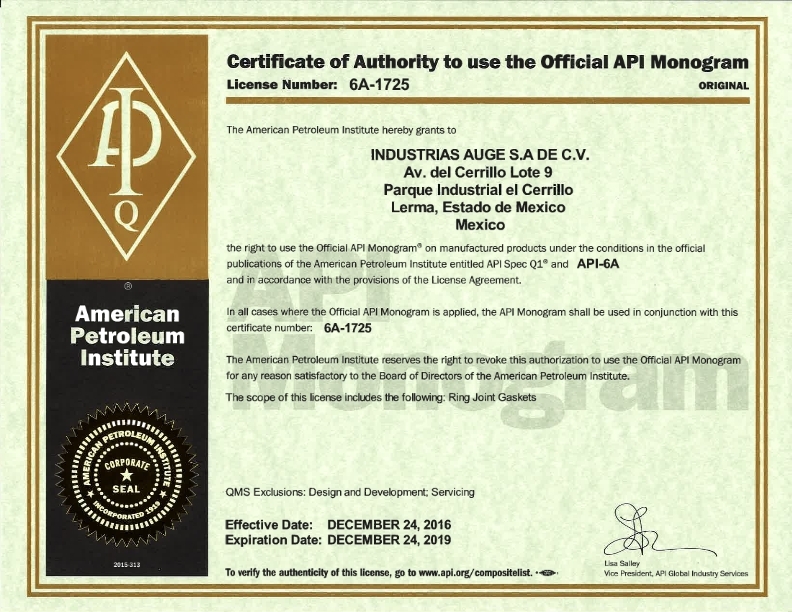 Recently, we obtained the certification for API 6A, which allows our scope to grow and give added value to petroleum industry supply chain. We are API Q1, API 6A, API 20E, API 20F, & ISO 9001 certified and approved as Global Supplier for numerous world-renowned industry leaders and recognized by ASTM, NACE, AWHEM, PESA, AMDEE, AWEA and Withford as Quality Approved Coater. Statement according to out 3 critical processes: Heat Treatment, Plating & Coatings, and NDE Examination. To meet and control our manufacturing process we performed QMS & Technical audits, we have full traceability of our product and perform in-house inspection and testing. This API standard specifies requirements for the qualification, production and documentation of alloy and carbon steel bolting used in the petroleum and natural gas industries when referenced by an applicable API equipment standard or otherwise specified as a requirement for compliance. This standard applies to bolting used in pressure containing and primary load bearing oil and gas equipment. 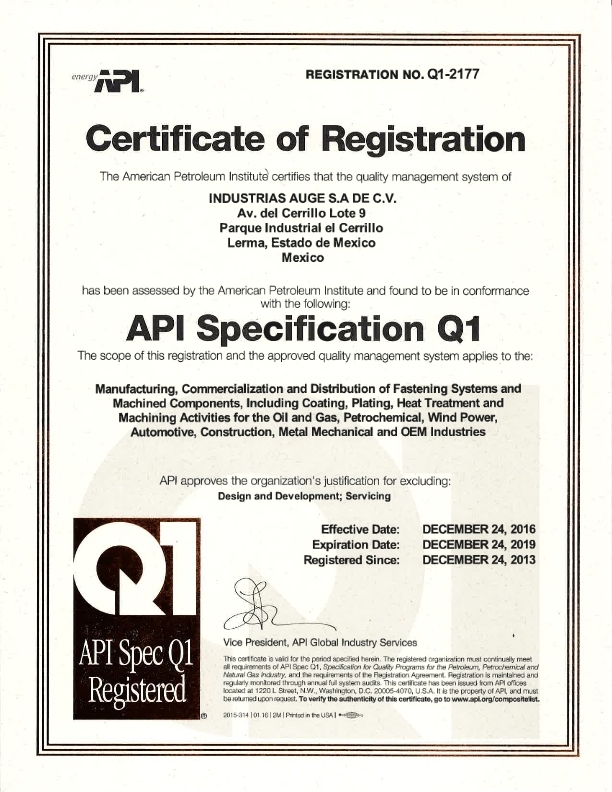 This API standard establishes requirements for the three bolting specification levels (BSL). These three BSL designations define different levels of technical, quality and qualification requirements, BSL-1, BSL-2 and BSL-3. The BSL are numbered in increasing levels of severity in order to reflect increasing technical, quality and qualification criteria.